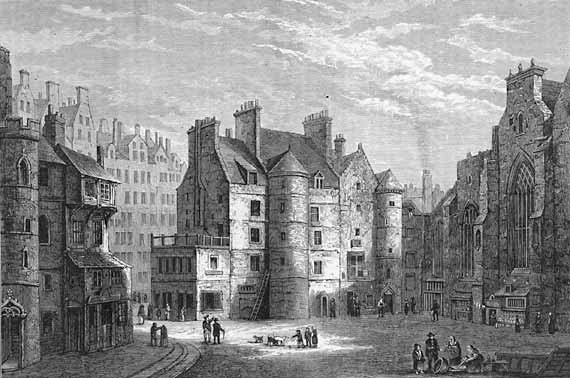 At two o'clock on 8th January 1697 a 20 year old student at Edinburgh University mounted the scaffold in Edinburgh to face the noose. The young man, Thomas Aikenhead, had been found guilty of blasphemy in December 1696 and just a fortnight later, was due to meet his fate. The court heard that Aikenhead had repeatedly and without reservation questioned the scriptures, debunking biblical miracles and doubting of those who subscribed to religion. Lord Advocate Sir James Stewart prosecuted the case and called for the death penalty as and example to others who might voice similar opinions. Only a young man and with no prior experience of the courts, Aikenhead appealed his sentence and the Privy Council handed the decision to the the Church of Scotland's General Assembly. They declined to agree to a reprieve, urging the execution to go ahead as a lesson to others. With his fate sealed, an apparently repentant Aikenhead wrote a letter on the morning of his execution in which he stated that "it is a principle innate and co-natural to every man to have an insatiable inclination to the truth, and to seek for it as for hid treasure. . . So I proceeded until the more I thought thereon, the further I was from finding the verity I desired. . ."
He read his final letter before setting off for the gallows, the last person to be executed for blasphemy in what would one day become the United Kingdom. How terrible..and to one so young! Religion has a lot to answer for in history. And so sad that his requests for mercy were ignored. Blimey! Who'd have thought it? Mind you, there are moments of extremism in this modern world of 'free speech' that make me think we haven't progressed that far. Hidden truths... Too bad he could not have lived! He could have brought much enlightenment! He died for the Truth he sought, he thought in vain in the end. The true blasphemy came from the lips of the prosecutor: 'Lord Advocate Sir James Stewart prosecuted the case and called for the death penalty as and example to others who might voice similar opinions.' So, really nothing to do with Truth in the end, only with punishment and revenge. Indeed; there was no dance of clemency, he was used to set an example. Another one for the American Humanist Assn. I adore you all the time, but the past week... complete devotion. That's so lovely, thank you! With the Church of Scotland watching , he was done for the second he opened his mouth.